Heart Mountain Relocation Center, Heart Mountain, Wyoming. Late last month I attended a pilgrimage to Heart Mountain, Wyoming, the former U.S. Government concentration camp where my mother and her family were placed for three years during World War II. My mother had not been back to Heart Mountain for 70 years, since she left as a girl of 12. She wanted to go, she told us, to see the mountain the camp was named after one more time. Its iconic shape, more like the angled smokestack of a cruise ship than a heart, had found a permanent home in her memory. While living in the prison camp she had even once had a nightmare about the mountain coming to life with flailing arms, rising up as if to smother her. The camp was one of 10 wartime prisons the U.S. government set up in remote locations of the country, where 110,000 prisoners, two-thirds of them U.S. citizens, were forced to live. The victims of wartime hysteria and race hatred following Japan's bombing of Pearl Harbor, they were stripped of their right to due process, forced to sell most of their belongings and given low-wage jobs running their own prison, as doctors, nurses, mess hall cooks, garment workers, policemen and farmers. My mother claimed not to remember much else about camp. Yet as we made the 13-mile drive from Cody, where we were staying, to the site of the camp and as the mountain suddenly appeared in the distance, she gasped audibly and whispered, "Oh my god, I can't believe it." Tears came to her eyes, shocking her with their arrival. She was unprepared for the onslaught of feelings, she told us later, of nostalgia and sadness. The weekend-long pilgrimage featured interviews with former prisoners, speeches by former U.S. Transportation Secretary and U.S. Commerce Secretary Norman Mineta and former U.S. Senator from Wyoming Alan Simpson (the two became friends when Simpson's Cody Boy Scout troop visited Mineta's Heart Mountain prison camp troop for a jamboree) and moving performances by the spoken word artist G Yamazawa. from the prison camp hospital still stand. But what made the biggest impressions on me were the stories of the former inmates themselves (so reduced in numbers now that the only ones still living were, like my mother, for the most part teen-aged or younger when they were in Heart Mountain). As we walked the former prison site and toured the Heart Mountain Foundation's sensitively organized interpretive center, memories flooded back to her. She remembered the windstorms that sent tumbleweeds scuttling across the camp, and how unlike now, no matter how far you looked in any direction, all you saw was sagebrush and that looming mountain. She remembered the harsh, sub-zero winters, and one snowball fight that landed her in the Heart Mountain hospital: it contained a rock that left her eye swollen and bloodied. Inmates, mostly from the Los Angeles area, were totally unprepared for the climate. My mother remembered that first winter how everyone ordered pea coats from the Montgomery Ward catalog. She remembered the servers in the mess hall walking down the aisle with gallon cans of sugar, doling out one teaspoon per person (paltry to a child to wanted more), and how she loved roller skating on the smooth cement floor of the laundry room. She remembered in summers, catching horned lizards in the desert, and a murder in the barrack across from her family's--fallout from a love triangle. "We had a little of everything," she commented. for a facial wound, remains. Looking at a photo of the Heart Mountain swimming hole, my mother remembered "almost drowning" when she couldn't get out from under some sort of barrier. Later that day, on the short bus ride to a memorial site that commemorates inmates who joined the U.S. Army to fight in Europe, I spoke to another former prisoner, a retired Seattle newspaper editor, who had the exact same recollection. "I almost drowned in the swimming hole, he told me. There was a platform that all the kids would jump on, and I couldn't get out from under it." The swimming hole still conjures memories of near-drownings. My mother remembered my Uncle Tosh leaving camp early to join the army, one of more than 750 prisoners who left Heart Mountain to serve in the U.S. armed forces during the war. She remembered that when he asked her what she would like from the outside, she requested an Andy Russell record and a ring with her birthstone, pink zirconia. Fifteen of those servicemen who left Heart Mountain to serve were killed in battle, leaving their families to mourn behind barbed wire. To the great relief of our family, my uncle was not among them. My mother also remembered Kiyoshi Okamoto, the founder of the Heart Mountain Fair Play Committee, coming in the back entrance to her family's grocery store in downtown Los Angeles before the war to talk politics with her father. 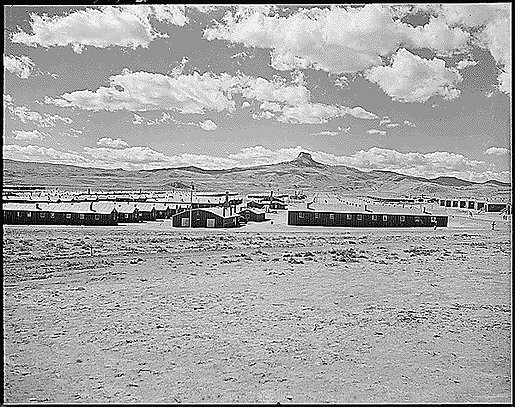 At Heart Mountain, when the military presented its "loyalty questionnaire," the Fair Play committee drafted its stance: members were U.S. citizens loyal to the United States and willing to serve in the U.S. Army, but only if their legal rights were first restored and they and their families were released from the prison camp. The Fair Play Committee set itself apart from the "no-no" boys, those who refused to answer yes to two key questions: would they serve in the U.S. armed forces if asked, and would they swear unqualified allegiance to America and forswear any allegiance to the Japanese Emperor. Both groups, especially the "no-nos," were reviled by many who joined the U.S. armed forces, in part to prove their loyalty to America. Center in Northern California, where the "no-nos" were isolated. My mother, who is now 82, does not think she will return to Heart Mountain. But she accomplished what she wanted to, to see that heroic mountain one more time. When I sent her this post to read before launching it, she told me there was one important fact that I'd gotten all wrong: the dream about Heart Mountain coming alive was not a nightmare at all, but actually a comforting dream. "I always had good feelings about that mountain," she told me. "It's the one thing I thought about when I thought about Heart Mountain at all." I realized that it was I who had projected onto that dream all my assumptions about what her repressed feelings about camp must have been. Surely behind her innocuous memories there lurked fear, anxiety and anger, or at least if they were not her own emotions, they were the internalization of those picked up from her parents and other adults near to her? Could it be, I asked, that making Heart Mountain a protective symbol was her child's way of coping with loss and tragedy? "That could be," she admitted doubtfully, "it's hard to say." Perhaps the deeper emotional truth of what happened to my mother 73 years ago will never be recoverable, and I suspect it is the same for many of the former incarcerees I spoke to. They remembered the daily events of school and play, the fun they had, but also the harshness of the climate and their living conditions. Today they recognize the gross injustice of the treatment they received so long ago, but its sting rarely pierces the stoic armor of Japanese gaman (endurance, patience and tolerance) and the practical shikata ga nai (it can't be helped) attitude that became the default response of so many who were imprisoned. Or maybe, as the translator and Fordham University Japanese language professor Mariko Aratani said to me, it's impossible to understand the Japanese reaction to the concentration camps because it belongs to "a totally different paradigm" than the worldview of most westerners and more assimilated Japanese Americans. For my mother, the trip "was sort of like closure," she told me. "Going back after all these years, and having all those hidden feelings emerge, I now feel like I don't need to go back again."